It is indeed a satisfying feeling when you help and saved someone who is in needs especially in times of critical situation. 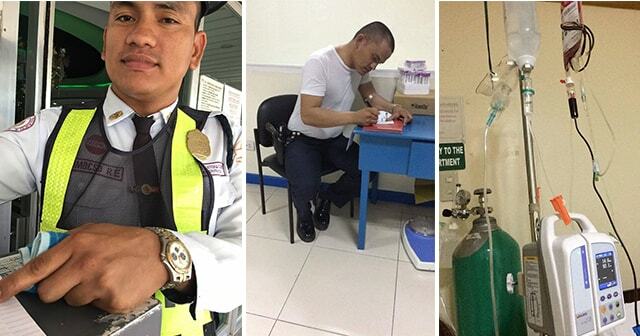 One of the trending stories recently that caught a lot of attention and praises from netizens is this heroic security guard from Las Piñas Doctors Hospital. According to Mica Austria-Corporal, the granddaughter of the patient's whos in needs of blood donation that Ryan Lomocso approached her mother and told her that he is willing to donate blood for her grandmother. The patience was in ICU that time and experiencing a shortage of blood. Corporal also added that there is no supply of Type O Blood that time and her mother cannot donate blood since she is awake all night to take care of the patient. “Kinailangan namin ng dugo, medyo matatagalan pa daw. Dahil sa ang bait ni kuya, nag-offer agad siya. Nakakagulat, imagine, hindi mo naman kaano-ano tapos biglang may nag-donate,” she told GMA News. With his dedication and desire to help the patient that time, This unselfish guard was praised by her co-workers together with her supervisors and some of the hospital patient too. His Supervisor describes him as a person who performs his job with a passion not just for protecting the hospital and all the patients and employee against people who have evil intentions but also to help patients during this kind of crisis and unfortunate event. “Hindi siya ‘yung parang pangtawid buhay ‘yung security profession, ginawa niyang passion,” LPDH Security Supervisor Francis Trinidad said. "He does not consider the security profession as just a job, but as his passion." Lomocso said in an interview that he is very grateful to help extend the person's life. It is very grateful to have someone like this guy who is willing to help without any hesitation. Long live sir Lomocso we hope that many of you will continue this kind of heroic deed.